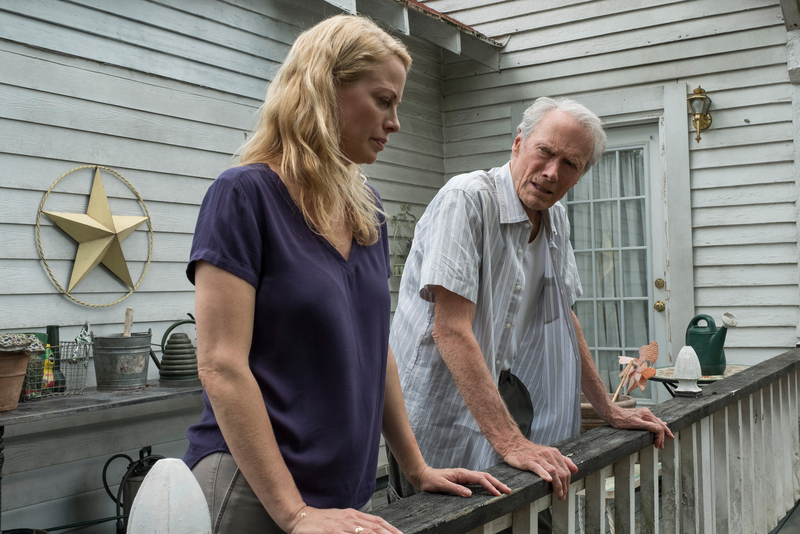 The Mule, the latest effort from Clint Eastwood, is kind of two movies in one, and Eastwood is pretty clearly only interested in making one of them. That one involves an irascible old horticulturalist, Earl Stone (Clint Eastwood), who becomes a drug smuggler for a Mexican cartel after he falls on hard times, transporting countless kilos of cocaine along America’s highways and byways in his pickup truck. This leads to a series of mildly hair-raising adventures in which Earl dispenses hard-won, down-home wisdom to cartel soldados — Ignacio Serricchio’s Julio — and DEA agents — Bradley Cooper’s Colin Bates — alike, reconciling with his own estranged family along the way. It’s a wry and gentle (remarkably gentle for a cartel story) tale of late-life regret and redemption, built around a pretty irresistible ‘based on a true story’ hook. The film that Eastwood doesn’t care for is also about an irascible old horticulturalist, who becomes a drug smuggler for a Mexican cartel after he falls on hard times. It’s the real story hiding inside The Mule: one in which brutal economic forces have robbed an old man of his livelihood, leading him to turn to the most extreme bastion of unfettered capitalism: the narco trade. There are hints of this film throughout The Mule, and they’re mainly shown in how Earl’s sudden wealth (he is very well paid for his runs across the country) enables him to pretty much buy a good life for himself and his Illinois community. Thanks to his side gig as a cartel courier, Earl is able to save his lily farm from foreclosure, pay for repairs to his local veteran’s club, put his granddaughter Ginny (Taissa Farmiga) through beauty school and pick up the booze tab at her wedding, and so on. The Mule never interrogates the morality of Earl’s actions, and almost all the cartel violence we do see is internal, as a sudden coup late in the film sees the nice old drug lords Earl is used to dealing with (embodied by Andy García’s gregarious jefe) replaced by a new, more murderous breed (headed up by Clifton Collins Jr.’s ruthless usurper). The notion that Earl’s activities might have a negative effect on anyone, that the end-users of his pick up tray full of cocaine might not be benefitting from his cross-country delivery drives, is never raised. Earl needs a job, Earl gets a job, Earl is good at his job and profits from it justly. The capitalist principle works — who gives a damn about the morality of the scenario? Which is a pretty decent fit for Eastwood’s personal, notably libertarian, political and, by inference, economic views, come to think of it. You might think that’s reading too much into the work, but the story that Eastwood is telling, one where an elderly man gets to have one last adventure and make amends to the family he’s neglected, feels very personal, so surely it’s not a stretch to extend that assumption to the film’s other elements. To be sure, the real-life story of octogenarian cocaine courier Leo Sharp has certainly been extensively reconfigured for the screen, with writer Nick Schenk, Gran Torino (2008), shaping him into a character more suitable for Clint’s persona and talents. 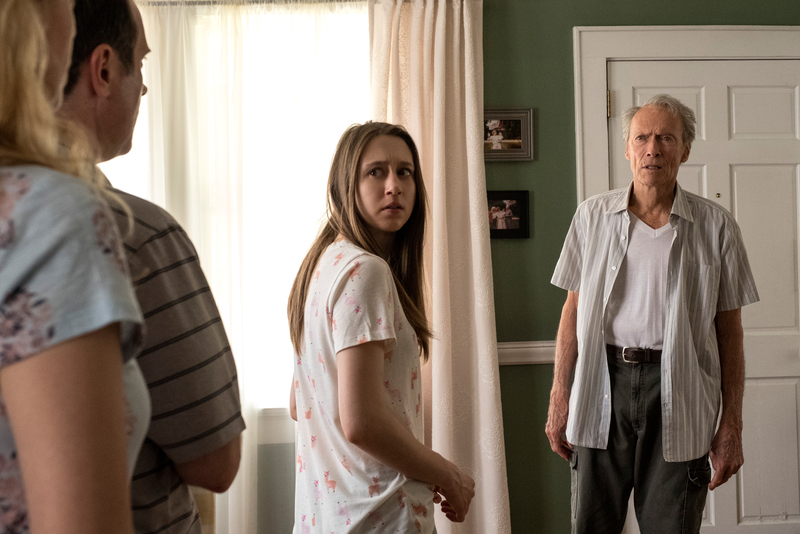 Still, The Mule is not nearly as self-aggrandizing as one might think based on some of the critiques in circulation. Eastwood is definitely playing his age here; he’s never looked frailer, and while he gets to be stoic in the face of danger, there’s never any suggestion that he’s capable of going toe to toe with any of the tattooed and prison-cut cartel footsoldiers he deals with. Indeed, his age and seeming harmlessness are what makes him an ideal mule — he’s an old white man in Middle America, the perfect camouflage. That old white man does bring some old white man ideas with him, though, and while one scene where he refers to a group of butch lesbian bikers as ‘dykes’ is excusable and kind of funny — they self-describe themselves as Dykes on Bikes, so he’s being polite — another in which he refers to an African-American family stranded by the roadside as ‘negroes’ doesn’t fly. That term has been unacceptable for decades, and Earl casually employing it feels like deliberate provocation — not of the characters in the film, but the audience in the cinema. Still, what’s most interesting here is the way that Earl’s desire to make up with his family perhaps reflects some of Eastwood’s late-life misgivings about his own workaholic tendencies and less than conventional family life (Eastwood has, at best guess, eight children by six women; Earl, for his part, enjoys two implied threesomes in the course of the film). All other considerations aside, it’s hard not to read a deeper meaning into Eastwood casting his own daughter, Alison, as Earl’s estranged child. While Earl’s situation might not map perfectly onto Clint’s own life, you get the sense that, in the character’s statements on the importance of family towards the end of the film, when the jig is just about up, and the chickens are coming home to roost, this is Eastwood trying to reconcile his own stated ethos with the actual facts of his life, mediated through cinema. 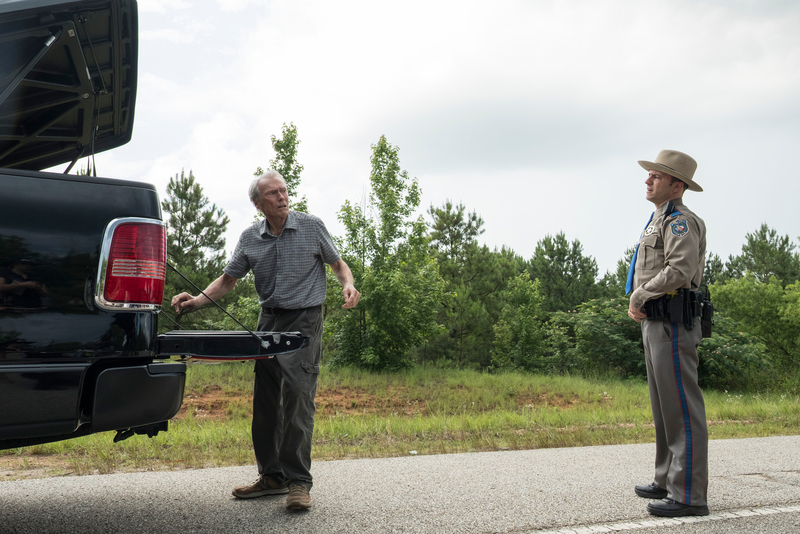 Which makes The Mule a fascinating film, if not a wholly successful one. While it’s frustrating that the narrative continually butts up against ideas and implications that it steadfastly refuses to ignore, the character work and simple professionalism of the production carry the day.